"I have always been interested in food. My mother never really cooked so I think it was maybe out of self-defense that I developed my interest in food. My sister is a chef, so I have learned a lot from her as well," Mooney says. The food writing course, for sophomore to senior journalism students, was launched in September last year. This semester, a second class was added to accommodate demand, with enrolment doubling from 20 to 40 students. Mooney says the class' appeal is connected to the cultural importance of food in China. "Food here is about sharing and community. Because the students and the Chinese people in general are so interested in food, I thought this was something the students would really enjoy and learn a lot from," she says. "It is also a way for me to relate to them on a completely different level. It is something that I am passionate about and they are too. "It is exciting for them to write about food - something they really love, but for them seems very ordinary, and to see that become something so big," Mooney says. Though, "once considered the lesser step-child of journalism" Mooney says food writing in the United States is, "now important enough for the 2007 Pulitzer for criticism to have been awarded to a restaurant writer", Jonathan Gold. "Food writing isn't about just eating. The best food writing also tells us about culture, geography, and identity," she says. The students' work is published on the website, Eating.Shantou, which Mooney says, "presents Chaoshan cuisine to an English-language audience". The site includes recipes of dishes sourced from students' families, reviews of new restaurants, and interviews with local restaurateurs, as well as with the Pulitzer-winning Los Angeles food critic, Jonathan Gold. It promotes local cuisine through articles in which students trace food traditions and provide insights into their city's history and culture. Students have profiled food ranging from the festive zongzi, or bamboo-wrapped rice dumplings eaten to celebrate Dragon Boat Festival, to the more banal, such as the typical Chinese breakfast of rice porridge, in Sabrina Wu's delightful tale of childhood rebellion titled, My Mother's Congee. Student Zeng Zhiwei says the food writing class opened her eyes to another facet of journalism. "I do like the class," Zeng says. "It opens a new field for me. It is not only about food, but the relationship between food and people." Students learn to generate ideas, gather information and convey their impressions of food in words. Mooney says teaching the nuances of writing recipes was a particular challenge, given the Chinese tendency to go on taste rather than measure ingredients. "It gives me a sense to be precise," J-School junior Zhou Guanlin says. "Unlike Chinese, foreigners ask for precise measurement for their recipes." The class reported on Shantou's food festival in December, and had the opportunity to test some of the recipes they collected at an end-of-semester event hosted by Mooney. "The students thought it would be really fun to try out some of the recipes, so they came over to my apartment on a Sunday afternoon and we cooked. The recipes turned out quite well, and the students really enjoyed themselves," she says. Working in pairs, they prepared dishes including chicken wings, chicken soup, sushi, beef with celery and fish. "It was interesting," J-School freshman Tan Guli says. 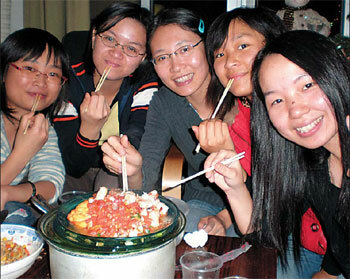 "It was a good excuse to hunt for delicious food," classmate Zou Baoying says. The Eating.Shantou site links to Mooney's personal blog, titled Have You Eaten Yet?, which is described as "one woman's attempt to eat her way through Shantou, China". "I was always adventurous in trying different kinds of food, but I have a lot of options here that I didn't have in the States," Mooney says. Her colorful site features videos of the cooking classes she has been taking with Chef Simon Lin, an experienced cook who mans a meat and vegetable stand on the university's campus. "He has been teaching me the local cuisine, the kind of cooking the Shantou people would do at home," Mooney says. "There is a lot of emphasis on fresh food, they use very light sauces and want all the ingredients to be very, very fresh, because they want the food to be healthful." Since making the Middle Kingdom her home, Mooney has been determined to embrace the legendary fearlessness of the locals. "It has been great to find how much passion people have about food here The people here in South China are famous for eating anything that swims, anything that flies except a plane, and anything on four legs. "It is definitely true, they will eat anything, and I think as a food writer you have to try everything at least once," Mooney says.